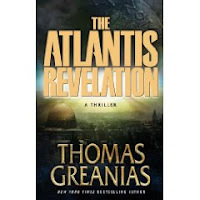 I received Atlantis Revelation courtesy of Shelf Awareness and this is a first time reading anything by author Thomas Greneais. The story is interesting, fast paced and gets a bit convoluted at times. Most of the time you can't tell the good guys from the bad guys and the only constant is Conrad. Even though Serena works for the Vatican, she seems to be a triple agent. All the players knew each other and I found the story a bit confusing at times. Probably because I haven't read the first two books in the series which are Raising Atlantis and The Atlantis Prophecy. I'll have to go back and read the other two books, then reread this one. Perhaps, then I'll be able to decide whether I truly like the story or not.